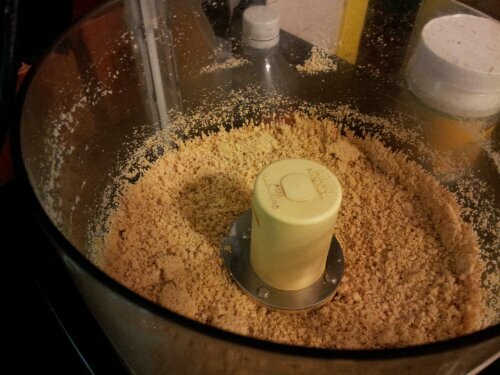 A while back, Ellie Krieger tweeted something about saving butter for a treat and using a nut butter instead. I actually PREFER a nut butter because of the satiety factor. Because I am a total brown noser, I tweeted at her about my home made cinnamon cashew butter and she retweeted me.. It also raised a question from one of her readers looking for a recipe. @ellie_krieger @piratejeniis there a recipe to be had? I forget that not everyone knows that nut butters are just.. well.. ground up nuts. I do add some oil because not every nut is as oily as say, peanuts. 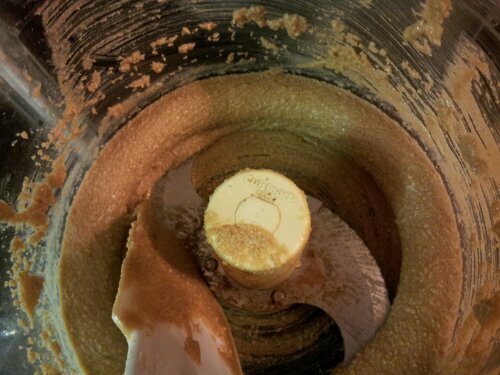 I told a friend of mine a while back that she could make her own nut butters and she was surprised that it was that easy. 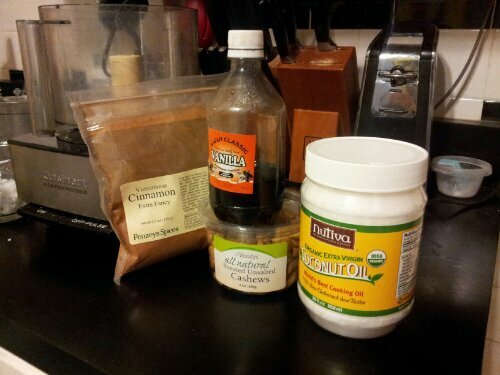 She’s gone nut butter crazy and is doing things like grinding up entire jars of mixed nuts… shazam! Get unrefined coconut oil. 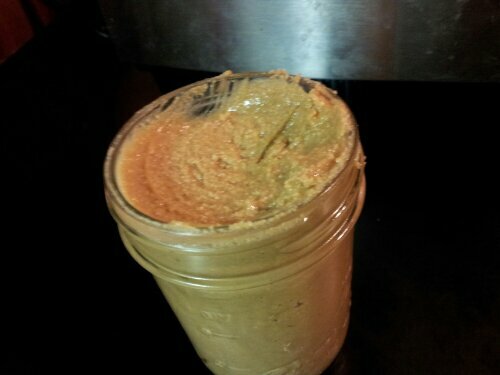 Cold press, preferably.. melt it..
put your cashews in your food processor and whirl until they look like this. 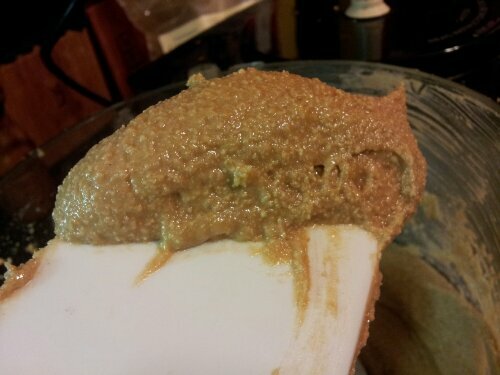 After you add the oil, it will clump up, whip around in globs and eventually get it’s act together and look like this. This is the consistency I like. Now is a good time to taste it. 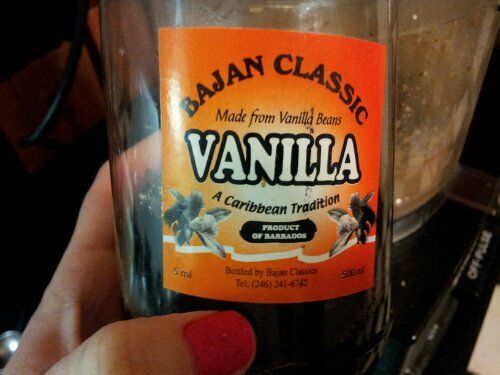 Does it need more vanilla? 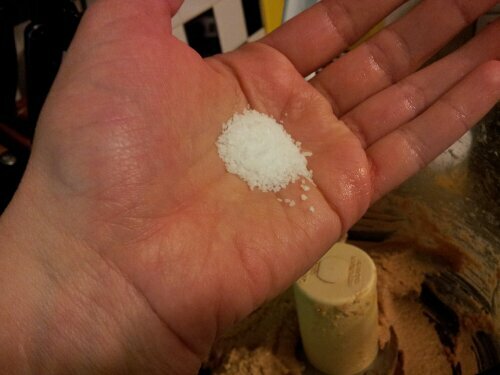 More salt? More cinnamon? You decide. Shove it in a jar and you are good to go! 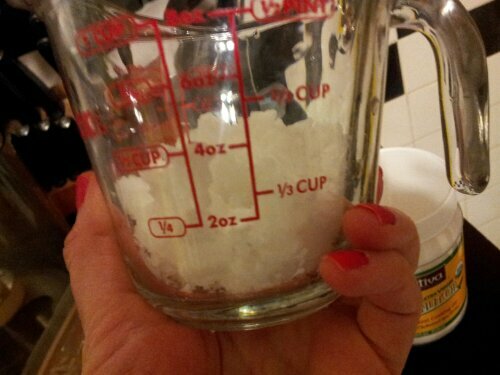 Because of the coconut oil, this will get HARD if you refrigerate it… but it will soften up again at room temp. I used to keep my homemade nut butters in the fridge but since I started using coconut oil, I don’t think that’s necessary. Your mileage may vary. This little jar doesn’t keep for long in my house. I eat it with a spoon. Side note: I don’t think this will save you any money. Cashew are expensive whether they are ground up or whole. 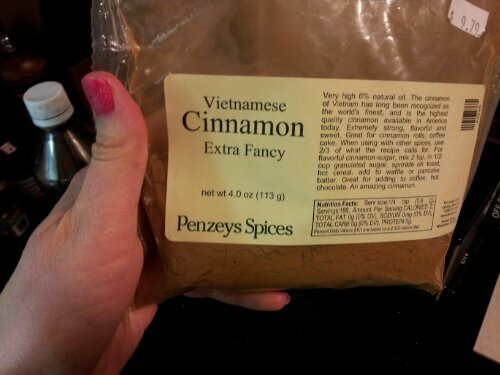 But I like being able to add my own flavorings. Also: the coconut oil adds a SLIGHT coconut flavor, which I enjoy. However, if you don’t enjoy that, feel free to use whatever neutral oil you do like.. you could also get fancy and get walnut oil or hazelnut oil, but that will get expensive quick. Just sayin. A paleo friendly nut butter made with unsalted cashews and coconut oil. Eat with a spoon! Or.. you know.. with a banana or on toast or .. whatever.. but mostly, a spoon! 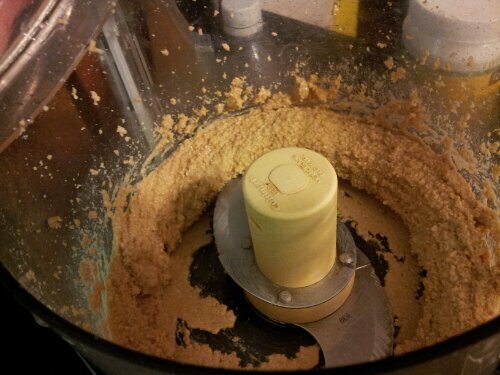 Put the cashews in your food processor and whirl until they resemble course meal. While the processor is running, drizzle in your melted coconut oil. Do not be alarmed if it clumps up. Just keep processing until it evens out. Add the vanilla, cinnamon and salt. Taste: adjust seasoning to your liking.